The CRM industry is rapidly changing and with it, new features are being launched all the time. Is your CRM vendor an innovator or a laggard? Company-wide implementations are hard, but if you’re not getting value from your existing solution, it might be time to consider switching CRM systems. 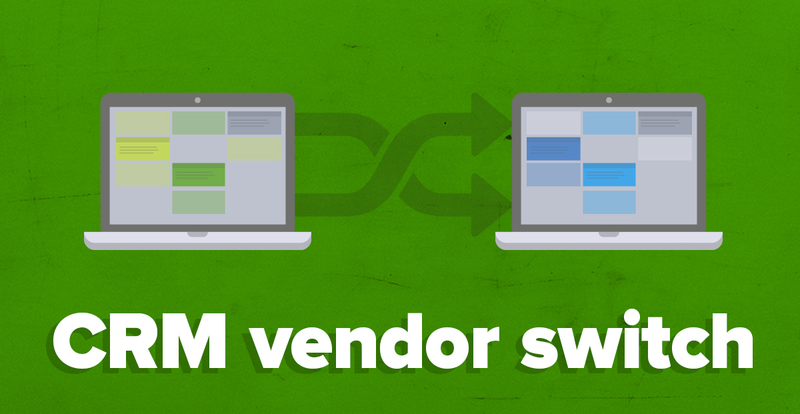 How do you know when it’s time to find a new vendor? We share 7 warning signs, backed by research, to help you review your existing CRM solution. We live in a world that changes at a super-sonic speed. What seemed like a cutting-edge technology 10 years ago has become a household’s necessity today. The same applies to the CRM industry: it has changed tremendously since it first appeared in the early 1990s. Not only is there a host of CRM vendors who are able to cater to any business’ size, needs and financial capabilities, but we’re now also spoilt for choice in terms of innovation. As a result, some older CRM systems lag behind, incapable to offer the newest, yet already indispensable, functionality. That’s why many companies today feel like they have outgrown the CRM system they have, and, therefore, consider switching to another CRM system. And if you’re one of those companies who feel the itch to switch, then this article is for you. Nobody likes change. And when it comes to CRM – there’s a lot at stake. You think that switching to a new CRM is going to be just too difficult and expensive for your business. After all, a lot of time and effort was put into your current CRM system: implementation, customization, onboarding and user training, not to mention the cost of upgrades and third-party integrations. Another worry is, of course, the “shock-horror” of transferring your old CRM database into the new system! In order to address your fears, let me, first of all, take you down memory lane. Why did you invest in the CRM in the first place? You must have had high hopes for it: you thought it would improve productivity, take your customer relationships to the next level of loyalty, streamline your sales process, and bring more revenue in the end. Now, ask yourself – do you still want the same things for your business today? So, what would you prefer – taking on a challenge of switching to a better CRM solution, or carry on living with the failing “legacy” system? There are a number of factors signaling that the time to move on from your old CRM has come. To determine whether or not you’re ready for a CRM switch, read through the list of “symptoms” below and see whether you find any of them familiar. As a start up, you kept things small – hiring only a handful of employees and working from a shoe-box sized office. Today, your company is a successful business and have fully-fledged departments, you employ more people and need more advanced tools to manage your operations successfully. Your company’s capacities grew together with its business goals. and many more modern CRM features. As a result, your database structure gets outdated, data input methods become obsolete, functional capabilities decrease, and integrations with the latest SaaS applications for sales or marketing become impossible. And the saddest part is that you end up creating tedious workarounds or – worse – simply go by working without the latest technology. The bigger your company grows, the more flexibility it requires in terms of technology. If you have a rigid CRM deployment plan, with problematic scalability, and/or poor remote access possibility, you risk lagging behind your competitors in terms of efficiency and service speed. access your CRM on the go and on different devices. For example, if your company has an international branch, it becomes vital for you to be able to work with a cloud CRM solution, as it allows everyone to log into the same database in real time. And if your salespeople often work in the field, it’s simply a must for them to use the mobile version of your CRM, which allows them to access and update customer information, tasks, appointments, or sales opportunities from anywhere, at any time and on any device. Today’s B2B buyer is craving for a great customer experience, not just a product. And, the cooler the appearance of that experience is, the better! Each new stride that the CRM evolution takes is directed towards improving the user interface (UI) and user experience (UX). 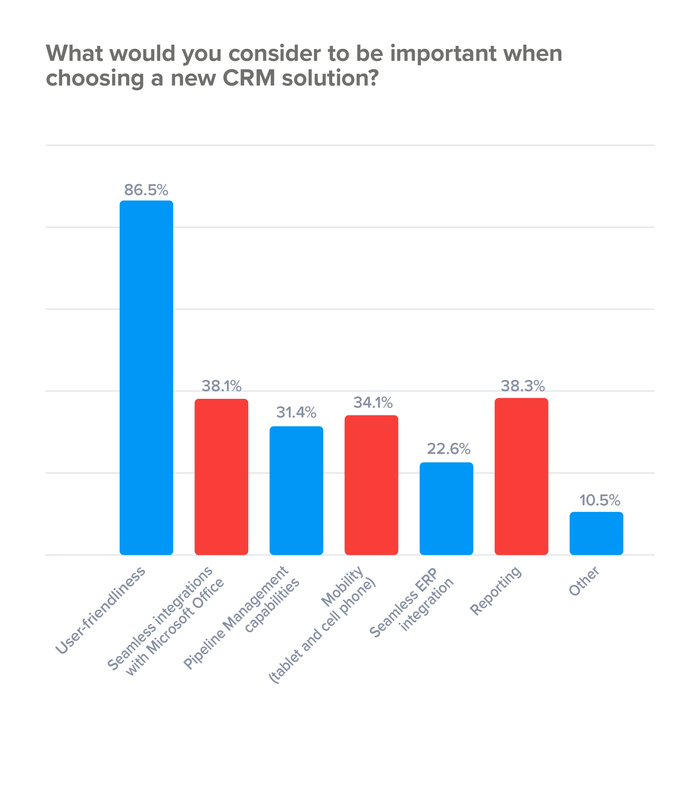 According to our own survey of more than 1,000 companies, 86% of our potential customers cite user-friendliness as the most important factor for choosing a CRM system and the ease of use as the critical factor for a successful CRM adoption! What can be worse than struggling to understand a system that is supposed to ease your day-to-day activities and help you multitask? Nobody wants to spend time deciphering the names of buttons and fields or get lost in the labyrinth of unexplained or illogical steps. Slow, bulky, complicated, non-intuitive CRM systems with old-fashioned or bland UI are doomed to be rejected by users and eventually sink into oblivion. If your team hates the way your current CRM looks like and operates, it’s time to switch! When it comes to CRM – having a lot of features is not always a good thing. Very often companies overestimate their needs in terms of various CRM functions. As a result, most of the features are either not being used, or needlessly complicate what is supposed to be simple contact management, sales, marketing or customer service tasks. 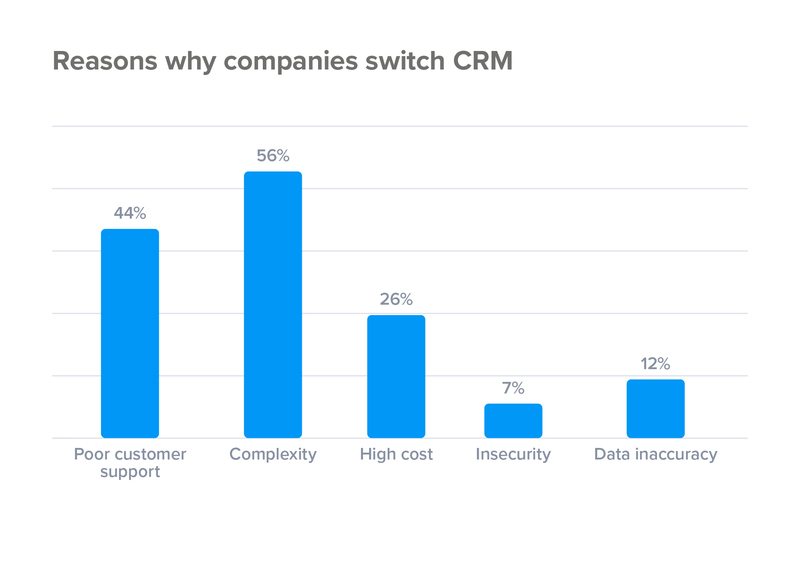 In fact, the latest research by Apptivo points that CRM’s complexity is the number one reason why companies get dissatisfied with their CRM system and think about switching to another system. It makes more sense to have a CRM that offers dedicated user plans, consisting of a set of features necessary for a specific job. What it means is that your sales people would be working with an advanced set of sales-enhancing tools and functionality, while your customer service team will be able to enjoy an array of service-related functions that will help them offer comprehensive and timely help, and your marketing team will be able to focus on preparing, sending and analyzing their marketing campaigns. 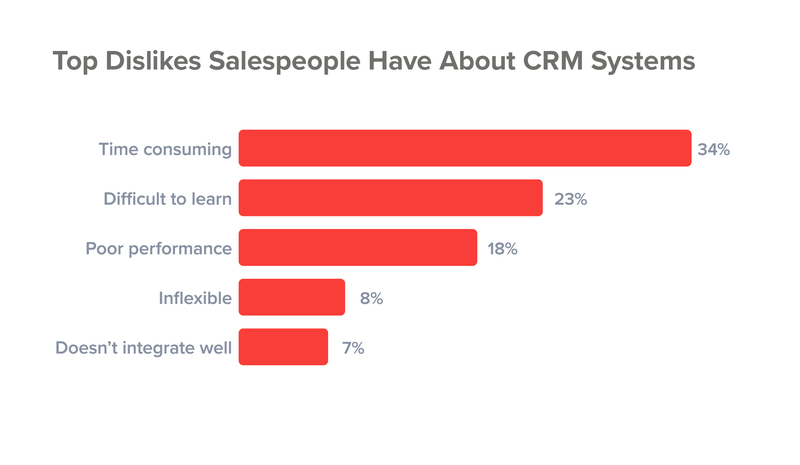 It gets even worse when salespeople reject CRM – as salespeople need a CRM system the most! Except that, salespeople are notorious for being the biggest CRM “haters”. According to research by Software Advice, the main reasons why sales reps dislike CRM is that it is a time-stealer and it is difficult. It’s a fact – if salespeople are forced to spend time on a complex and confusing system, they’ll simply ditch it, ruining the whole purpose of having a CRM. That’s why, if you consider switching to a new CRM, it’s paramount to choose a system that’ll help your B2B sales team quickly enter and access important information, as well as automate the essential sales processes. Another worrying symptom is if you don’t receive enough support from the vendor. First of all, when adopting a CRM system, you and your employees need sufficient and in-depth training. That’s why it is important to choose a CRM vendor that can offer hands-on, interactive training and support. Secondly, if something goes wrong, like a malfunction or a bug, you need to be certain you can contact the vendor and receive help quickly. After all, you have a job to do, and technical glitches should not deter you from running a business. Also, you shouldn’t worry about receiving timely and hassle-free upgrades or performing complex integrations and be certain you can request a consultant’s service in case you need to further customize, expand, or integrate your CRM with new programs. If the vendor is not available for consultations or not offering reliable customer support, then your general productivity may be seriously affected. Having CRM software means that you’re storing information on prospects and customers. This also means that the way you store and process personal data of EU citizens in your CRM must be fully in line with the new General Data Protection Regulation (GDPR). A lot has been said about GDPR lately; how it impacts sales, how it affects marketing and the costly consequences that non-compliant companies may face. That’s why you should take it seriously, if your current CRM system does not support GDPR-related functionality, and you have to store GDPR documentation separately. Having a GDPR-compliant CRM system is not only going to help you avoid legal troubles, but also significantly ease the burden of obtaining, documenting and storing consents, legal bases and subscriptions in a lawful way. Moreover, it will help you audit and update your existing database to only store the information that is required in an easy, timely and legal manner. So, if your current CRM does not offer GDPR-compliant functionality, it is a massive red flag signaling that you need to switch. If you self-diagnosed yourself and found a few symptoms that describe the relationship with your current CRM system, then it’s time to act. Moving to a new CRM is not as frightening and difficult as you first thought. What you need to do is get properly ready for the move and do your research to find a perfect CRM match for your business. Examine multiple offers and seek professional consultations. If carefully selected, the right solution will certainly bring the benefits that you originally envisaged for your business. If you need more information on how to find the right CRM for your business, then download our recently updated 2018 CRM Buyer’s Guide. Alternatively, you can click on the link below to request a personalized demo. Great read, I now know exactly what to look for when changing CRM! Can't wait to share with everyone else here. Hi Kevin, great to hear you liked the content, please do request a free demo if you wish to see SuperOffice and how it can help optimise your sales, marketing and customer service processes. Thanks, this article can help me to make decision. In general, CRM is something more than a tool. All processes around should be smooth and optimized. Totally agree! The bigger your company grows, the more flexibility you require in terms of CRM technologies.